KDH were successful in the competitive tender for works with this high profile British burger company with multiple outlets in London and surrounding areas. 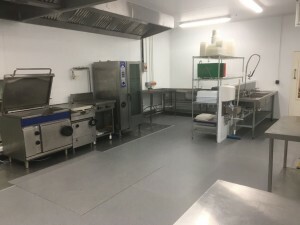 The client required the existing site to be developed without interrupting the food preparation required to keep the restaurants operational. 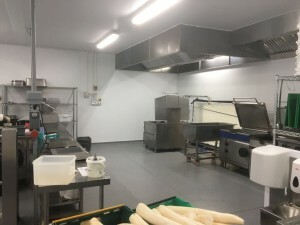 A new mezzanine installation has allowed the client to increase the commercial kitchen area and increase chilled storage space within the existing building. 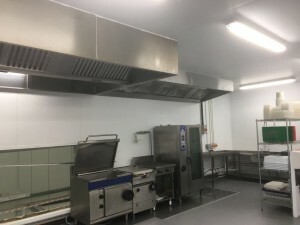 Work comprised of new stainless steel drainage (ACO EHEDG approved design) and resin flooring (Foodcrete polyurethane with Ion Defender range used), New insulated panel walls and ceilings using PIR core Firecheck panels, Fire walls using Mineral fibre panels, and doors to meet 60 minute fire rating requirement. The mezzanine area was completed, as an all inclusive package, including meeting building control requirements, client working loads and bespoke structural design and calculations to meet existing facility usage. KDH London based teams completed the new refrigeration and ventilation to meet the chilled and fresh air handling in the new areas. New mechanical and electrical works, power drops, hand wash, hygiene points, lighting, emergency lighting, fire alarm upgrade and integration all completed to power up and service the new areas. We were also able to complete the management and integration to meet production deadlines with the site facility upgrades, including new mains gas and electrical works with national providers. The project was completed under F10 notification and full CDM management working with the client to utilise site space and minimise the financial impact, providing added value within the project.